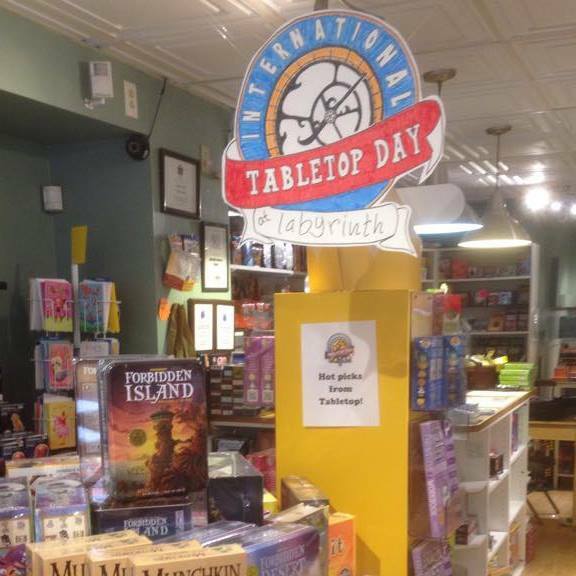 International TableTop Day 2015 took place on April 11th. This is a yearly event created in 2013 by Geek and Sundry, the producers of the TableTop web series, to celebrate tabletop gaming in all forms, especially board games. Since then it has continued the profound impact the series has had on board game culture by bringing it to people on a local level. It’s gone quickly from a small livestream of games to a day that currently has thousands of events going on all over the world. These events are a great look into the world of board games today! 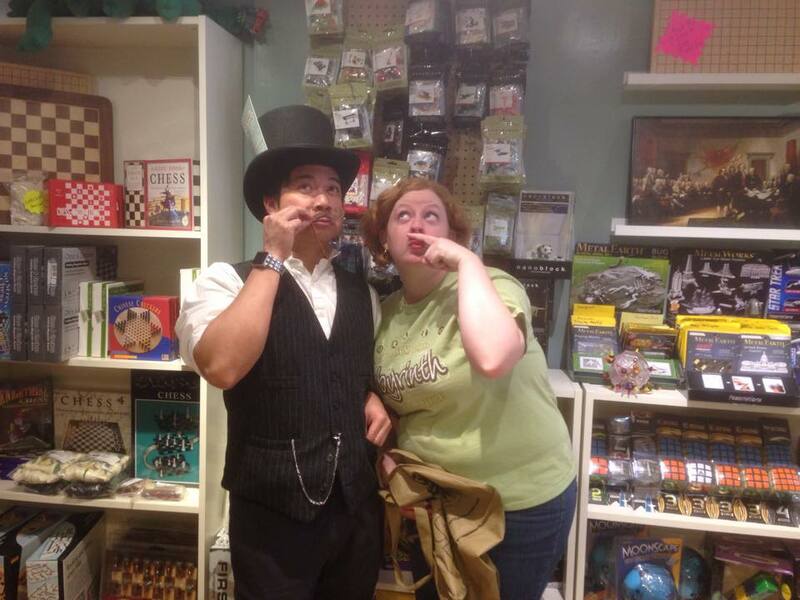 For 2015, we headed to our local game shop Labyrinth Games & Puzzles in Washington, DC to see what was happening. Games, games everywhere! The store welcomes everyone in with a handmade sign. It’s not always easy to convince people that there are board games beyond Clue and Scrabble, but TableTop Day events are a great way to see some of the huge variety that’s out there. We got to watch demonstrations of Dungeons & Dragons Attack Wing (a strategy game with dragons locked in aerial battle), Heat (a drafting-style card game where you play criminals trying to pull off heists while staying under the radar as much as possible), and Exploding Kittens (a goofy party card game about, well, trying to keep kittens from exploding). A number of local game designers were on hand with demos of their own games, and we played Ben Rosset’s Brew Crafters card game which is a clever strategy game about brewing beers for single players or teams. Several game companies, such as Steve Jackson Games, were also running demos for both kids and adults. Games which have been featured on the TableTop web series were displayed prominently, but people were here to play anything and everything that was available. People were happily playing Labyrinth’s usual selection of demos wherever they could find space, and I spotted at least one game of Magic: the Gathering squeezed onto the end of a table. Many games were purchased, unwrapped, and immediately brought out to play. Questions about games were swiftly answered and sometimes discussed at length; I spent quite a while in a conversation about the differences between Fantasy Flight Games’ Letters From Whitechapel and Ravensburger’s Scotland Yard. I even watched people carry in their own copies of games by local designers for autographs or, in one case, a rules clarification directly from the creator. A few of the proceedings had a distinctly steampunk flair. Events like this tend to highlight some of the best things about today’s board game culture. There are hundreds of unique and clever games out there and more showing up every day, and the great majority of board game enthusiasts just want more people to play with and love welcoming new players into the fold. The vast numbers of available games can quickly get confusing; however, along with the terminology, experienced players will drop to describe a new game—most people don’t immediately know what a Euro-style or drafting game is. Plus, not many places have large board game stores accessible. Fan-run events for TableTop Day or similar celebrations can help ease new people into an unfamiliar and overwhelming world without the stress and often without dropping sixty dollars on a large board game without trying it out first. The day was beautiful and perfect for playing games outside. Aside from just games (the place was packed and there weren’t always tables to sit and play), there were also plenty of other activities going on. The back porch of the store had been turned into a mini carnival ground, complete with free popcorn and games of chance to win prizes, like a wheel to spin and a pegboard chip drop. I didn’t win anything, but spinning the wheel also entitled you to pick a promo from a basket overflowing with items from dozens of games (I picked a Fluxx expansion pack themed around TableTop Day, though I was sorely tempted by the King of New York stickers including a fantastic Cyberbunny). Activities aimed more at kids, such as creating your own jigsaw puzzles and tangrams, abounded earlier in the day. By the afternoon, things got a lot goofier with a live-action version of Get Bit!, a game about being eaten by a shark—and yes, this included someone in a shark costume. Multiple activities help emphasize the core of what should be happening with board games—fun. This seems obvious, but in reality it’s not always the case. Many of us were raised with board games that are fun for a few, but certainly not for everyone, like Monopoly or Risk or games that were too simplistic and didn’t offer any challenge past childhood. Some people had very competitive siblings, friends, or even parents who sucked the enjoyment out of games. Most people set them aside after middle school and rarely return. 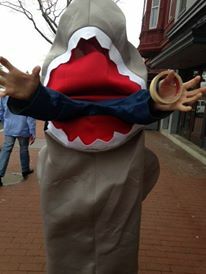 How can you have a game day without someone in a shark costume? But here, the byword was fun. If you couldn’t find table space to sit down and play a game, you could watch others pilot the Millenium Falcon across a mat printed with a starfield or ask a game designer about the artwork on the cover of their game’s box. If a strategy game wasn’t up your alley, you could try Forsooth!, a game where the players create a lost work by Shakespeare or Concept, a sort of charades variant where symbols on a board are used to express ideas. We were beaten soundly by the other team at Brew Crafters, but we had a good time. This is one of my favorite things about Labyrinth at any time—they foster a welcoming environment to all and one where everyone who shows up can have fun and do their best to help prospective players find the right game. Throughout the day, as you played demos or spun the wheels at the carnival games, you were given raffle tickets. The system was clever; rather than pulling a name from one big box for each prize, you chose which prize you wanted to try for and your tickets were put into an individual box for that prize. 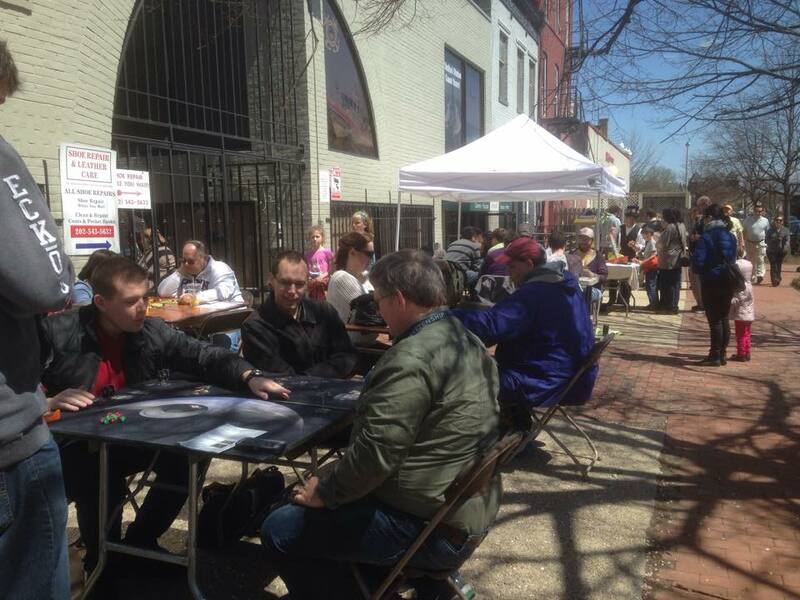 There were over thirty prizes to choose from, ranging from games donated by game company Asmodee to pairs of tickets for Hunt DC, a giant local scavenger hunt happening later in the month. Everyone from my usual gaming group stuffed the box for a massive Concept playmat (a favorite game of ours) and got the perfect end to a wonderful day on the way home that evening when we got a text informing us we’d won.